Oh friends, where did the week go? Don’t get me wrong, I am ecstatic it is Friday but each week gone is another day gone. I have become very aware of how fast times goes lately. My kids have one month left of school for the year. My youngest will be entering Kindergarten in the fall and I have spent way too much of my time watching videos of my tiny littles when they were all home with me all day long. Those days were long, tough and some feeling impossible to get through. But, looking back on them with just a few month until all three will be in elementary school I feel as if those days were not long enough. I am sooooo looking forward to this summer and have plans to soak in every single moment I can with my three kids. I can start by doing a little of that this weekend, along with a few home projects of course! Also some catching up on some of my favorite home decor blogs, Home inspiration and weekend reading, week 5 is all about looking back as well. Looking back at previous One Room challenges. For those of you not familiar with The One Room Challenge, it is a grueling 6 week room redo. 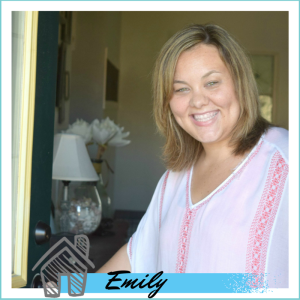 Bloggers take on a home project and have 6 weeks to transform that space. The most recent one is happening right now and I am wishing I had taken the plunge to do it. I had planned to redo my dining room for the ORC but with all of our recent discussions on what we are going to do with our home I felt it was best to wait for anymore major home renovations until I know if I am selling or staying put. Last November I took part in my first ORC and redid my boys’ bedroom. It turned out magical and their built in bunk bed is stuff of little (and big) kids dreams. I have overheard more than one child visiting our home comment on the awesome beds, also the drum set in the corner. We are just awesome like that around here. Caleb and Gavin have one amazing room and it works for them in every single aspect. 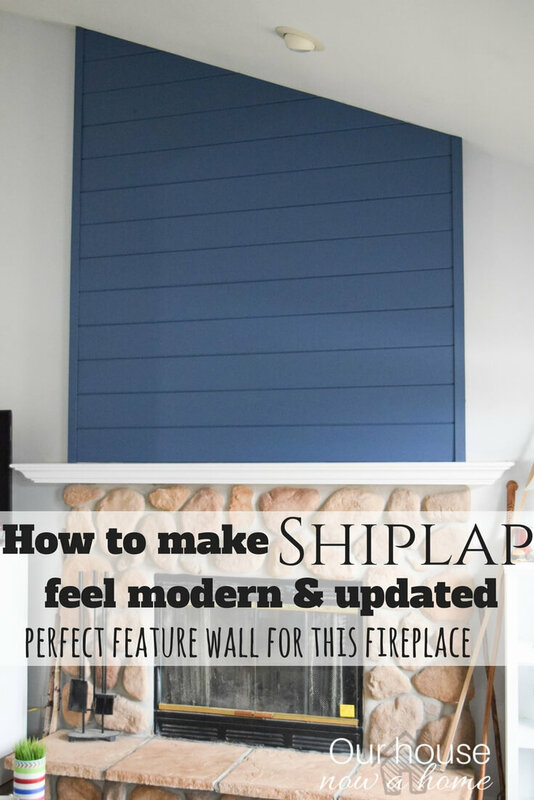 I love the idea of redoing a room with well thought out plans from start to finish. I am not usually that organized with my decorating. I hope to have myself and our future home plans figured out by fall so that I can hop right into the next ORC challenge, it is so fun to follow along! This weeks Home inspiration and weekend reading I am sharing previous reveals from my blogging friends and their beautiful One Room Challenge rooms. This bathroom from Little bits of Home is stunning! I love the soft colors and finishes in it. Samantha used some of my favorite decorating colors in this room which is a definite win for me! 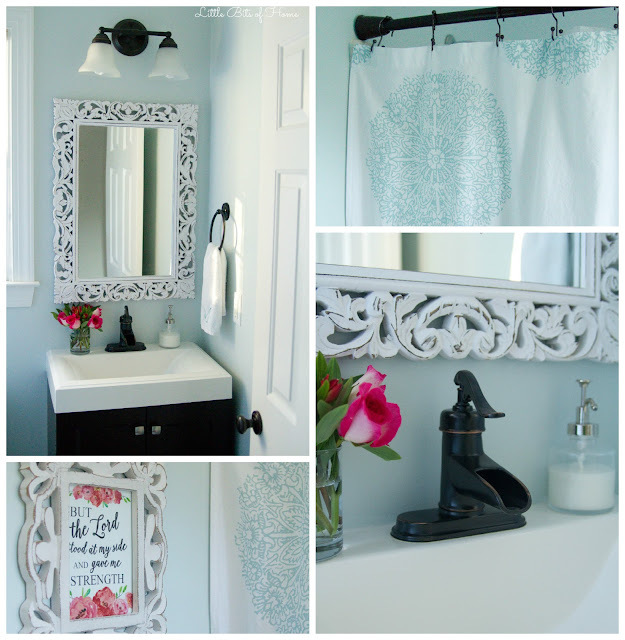 The before of this bathroom was not horribly just “meh” but she made is shine beautifully! Crystal at The Weathered Fox is one talented lady with a beautiful home. When she redid this home office she turned it into a bland and uninspiring space into a place I would be happy to work in! I love the light colors, the rustic elements mixed with personalized touches. It is a real office and a great layout for work. Seriously, there are a ton of small details in this space you have to see! OK, seriously…. this is one of the most beautiful bedrooms I have ever seen! Sharon from Pretty Practical Home created this room for her daughter Paige and it is stunning. I love the simplicity of it, the color scheme and that bed is gorgeous! I have been redoing Nora’s bedroom little by little and this makes me want to scrap it all and start over with something as sophisticated as this room. This bathroom redo from The Blooming Hydrangea is so classy! I was not aware that bathrooms could be classy but they can because this is it. The simple colors, lines and decor in this make the space feel huge. The gold touches are so great and really pop next to the light wainscoting. This is such an amazing before and after you have to see! Guys, I thought my bedroom/office was good. But this office makeover from A shade of Teal is on a whole other level. That desk is amazing, the tiny ways to organize office supplies, the colors, the lighting…. can you tell I am obsessed?! I wonder if Katy would mind if I made her home office my blogging headquarters? I can just work in there during the day, I feel like I would get so much done because it is a beautiful and calming space. I am taking notes from this room for when I finally get a office/craft room all to myself. This laundry room makeover from Lemons, Lavender and Laundry is amazing. Not only because it is a great redo with a ton of functional pieces but also because it was done with only $100!!!! Erin is so talented to take on a task and challenge like this but the results are perfect. I love the colors and all of the functional pieces she made to help improve this room. 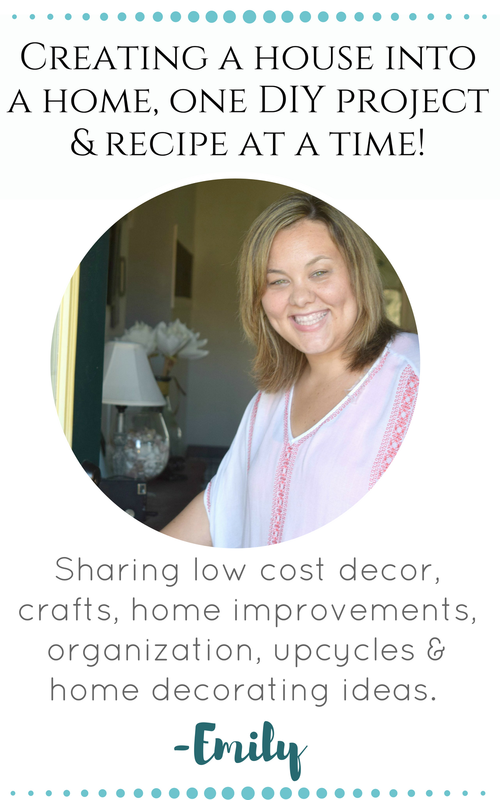 Seriously, you need to go over and see her low cost and simple ideas. 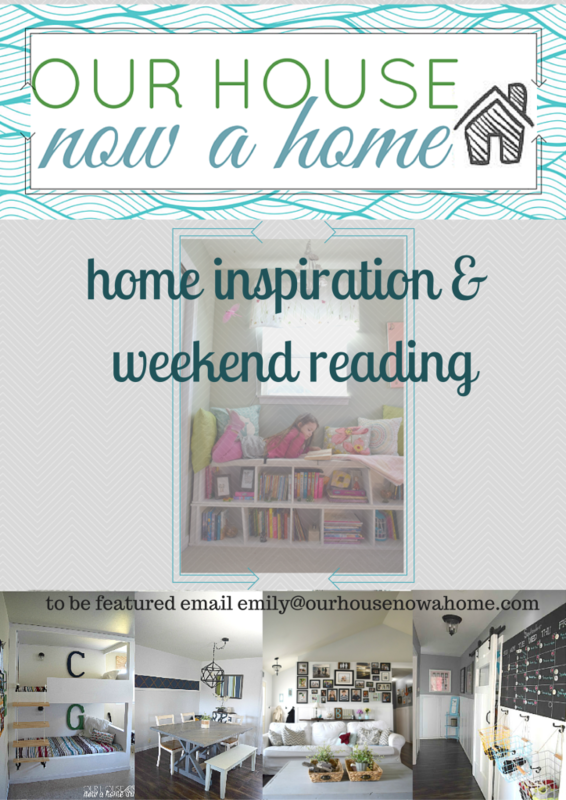 Alright friends, there you have it, the Home inspiration and weekend reading, week 5 for you to enjoy. All about room reveals, which will for sure give you plenty of inspiration to help you through the weekend. Each post that you click on fro these bloggers will also include the 5 weeks of previous posts, so you can see the entire process for these rooms. You can totally geek out now on this home decorating overflow of ideas… your welcome! 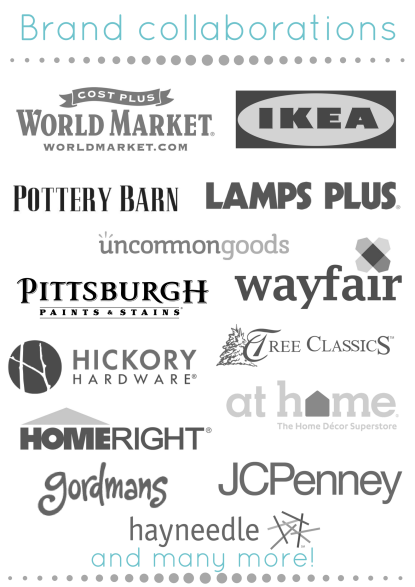 I am off to do some shopping this weekend, I have a major project happening in my home. I will be giving little hints on social media and a reveal happening next month! Be sure to follow along with my social media so you can see any behind th scenes hints. I also plan to do a ton of cuddling with my littles because they are still small enough to fit on my lap. Take it in while I can! I hear you on soaking in every moment with the kids! Great picks on the ORC makeovers. I can’t wait to hear about the major project you’re working on. Sounds exciting & fun :). Enjoy your weekend! These rooms are truly beautiful, I don’t understand how any of them were done in six weeks. That impresses me. LOVE the bathroom mirror by Little Bits of Home! So pretty. I still have the builder’s grade mirrors in my bathroom…from 8 years ago. I really need to do something about that, and this is great inspiration. What an inspiring post!! 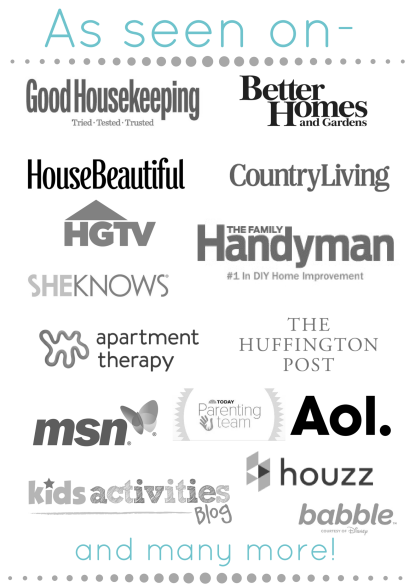 It’s making me want to get to work with the million makeover projects I have been wanting to do! And your boys do have the coolest bunk beds ever!! Such great inspiration pics! We keep going back & forth on when to start our kitchen. I don’t want to be without it, even for 6 weeks! I love this round up of pretty spaces! 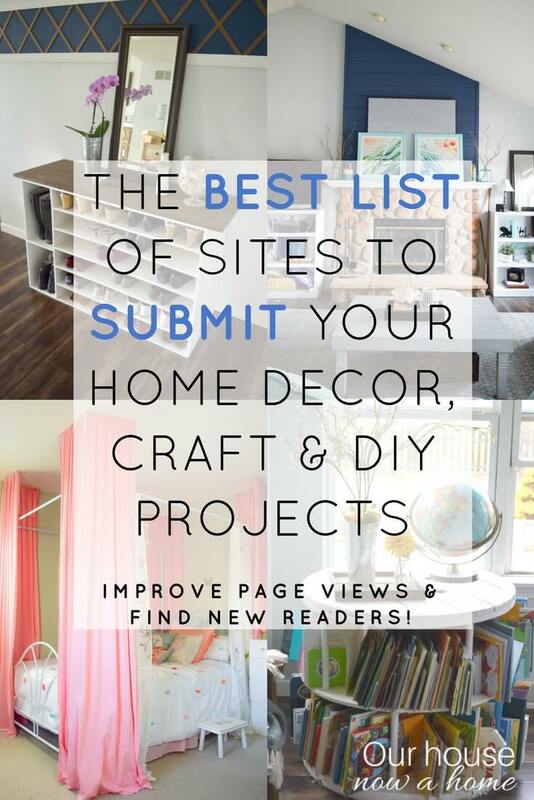 I have so many projects that I want to do at my house – these look great. Thanks for the inspiration! Those are some great looking rooms. Makes me want to redecorate myself. Nicely done. I just love this. 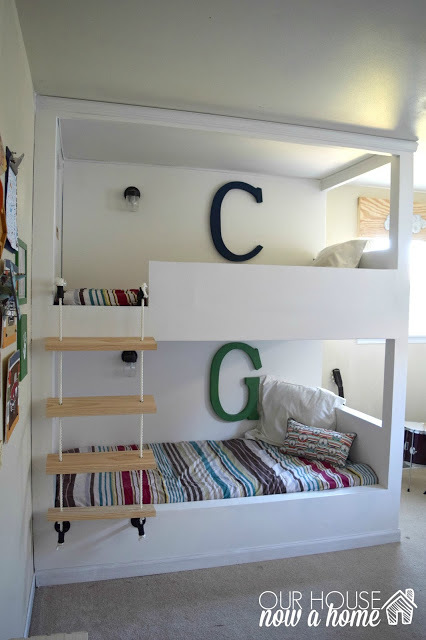 Especially the bunks with the big initials! That black and white bathroom is just gorgeous. My sister did something similar, but with the boldest red you’ve ever seen – it doesn’t sound like it would work, but it totally did. Wow! What a lovely collection of rooms! They are each so beautiful while still remaining functional! Do the littles have to grow up so fast? I love your home picks… I’m loving the bunk beds built in!!! wow! They all look absolutely stunning! Great inspiration. I am with you on wondering where the time is going lately, my kids will be 7 and 9 soon and I can’t believe it! Nicely done!! Bunk beds are awesome. Love the letters in their room and all the white furniture!! 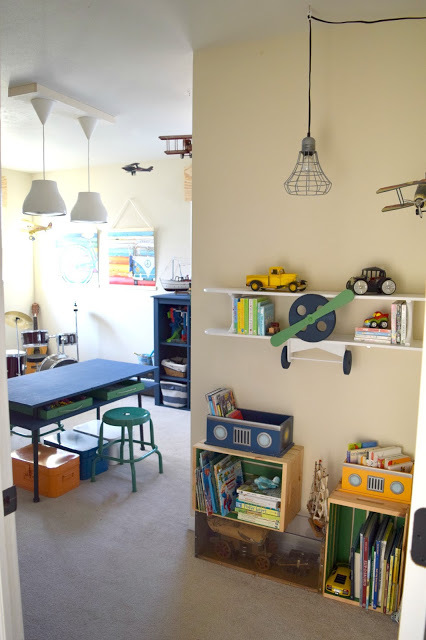 Love everything about the kids’ room remodel! I need to take some of these ideas for my daughter’s room. 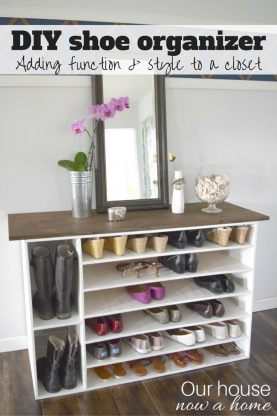 I’m slowly redecorating my house and I love all of these ideas! Such amazing inspiration!